Gov. Bruce Rauner speaks to his supporters after he was elected governor of Illinois on Nov. 4, 2014. 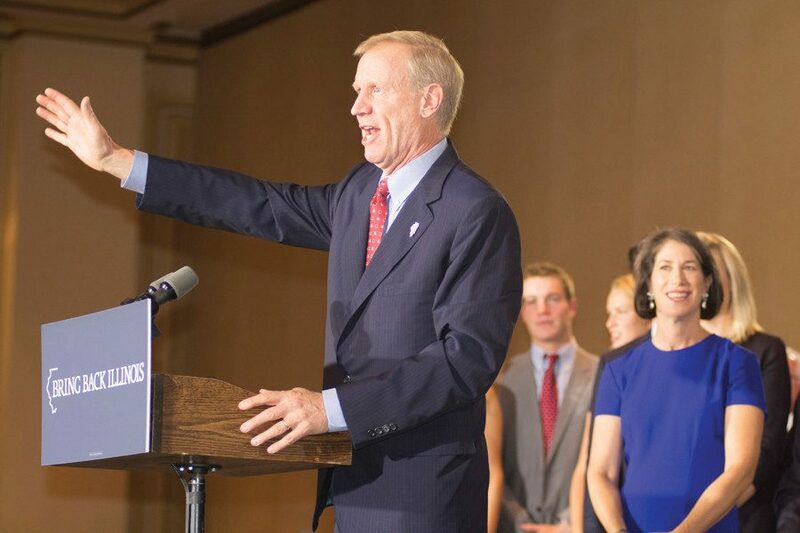 Rauner is being sued by anti-abortion pregnancy centers for a bill that requires doctors to give patients information about abortion services. Anti-abortion pregnancy centers in Illinois have filed a federal lawsuit against Gov. Bruce Rauner over a bill requiring doctors to give patients information about abortion services and other alternatives to carrying out pregnancies. Senate Bill 1564, an amendment to the Illinois Healthcare Right of Conscience Act, has been a point of contention for both anti-abortion and pro-abortion groups in Illinois. Anti-abortion groups say Rauner has failed to meet his campaign promise to stay away from social issues. The groups allege the bill, which Rauner signed into law in late July, violates fundamental rights including freedom of speech and religion. Eric J. Scheidler, executive director of the Pro-Life Action League, said the bill infringes on both First Amendment rights and the right of conscience, which allows health-care providers to refuse to participate in giving care that would violate their moral or religious beliefs. He said anti-abortion supporters were particularly disappointed in Rauner, who is a Republican, in light of their support for him over former Democratic Gov. Pat Quinn in the gubernatorial race. On the final vote in the General Assembly, every single Republican member voted against the bill. However, Brigid Leahy, director of legislation at Planned Parenthood Illinois, said the bill isn’t just about abortion. The bill amends Illinois law, which she said “was the broadest in the country for what it was allowing providers to do,” including states that are usually more conservative. The American Civil Liberties Union said critics of the bill are extreme and the bill was a compromise with Catholic organizations. Through work with the Illinois State Medical Society, the Catholic Healthcare Association of Illinois and Catholic Conference of Illinois, his ACLU team was able to compromise on a neutral bill, Yohnka said.